when embarking on the quest of our lives, the first test is always finding the courage to escape the comfort and protection of home, and the guardianship of our parents. the geek behind the curtain: all shots and layers in this assemblage were taken and developed by myself. 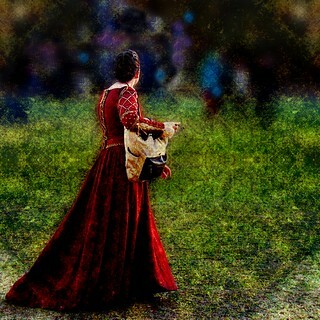 1 candid, hand-held, point-and-shoot shot from the medieval faire, 1 layer of blur, 1 texture layer cut into 3 pieces and blended variously into the main image. the colorful blobs are other faire-goers who've been blurred and cloned a bit until they resemble will-o-the-wisps or some other strange magic at the threshold of our heroine's journey.